For as long as they have been producing sake, the Japanese have developed a wide range of vessels for drinking and decanting the beverage, fashioned from a variety of materials including earthenware, porcelain, wood and glass. Vessels for drinking cold sake are collectively known as reishu-hai, and are generally, though not always, made of glass. They come in a variety of shapes and sizes, including small, stemmed glasses that are often placed inside a square wooden box called a masu. Masu were originally designed to measure rice, and hold 180ml. In days gone by, sake was drunk directly from the masu, and still is on ceremonial occasions, particularly around New Year. 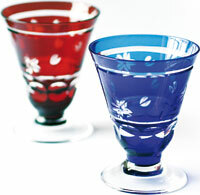 Reishu-hai can also take the form of small glass tumblers featuring beautiful coloured glass and intricate cut-glass design work, which is known in Japanese as kiriko. Warmed sake on the other hand, is most often served in earthenware or porcelain vessels. Made for millennia, Japanese pottery is highly collectable. The most commonly found pieces nowadays are small flasks called tokkuri, and even smaller cups called o-choko, into which the sake is decanted and drunk. Variations on the o-choko include guinomi, which are generally larger and deeper, and sakazuki, which are shallower and wider, and are used in traditional Japanese weddings. There are a number of other novel variations on the sake cup, which although are fun to use and very collectable, are not used on an everyday basis. These include bekuhai, which have a rounded base (sometimes with a hole in it! ), so they cannot be put down until the contents has been completely drained, and often have faces painted on the bottom. Bajohai (literally ‘horseback cups’), are stemmed ceramic vessels, so called because they were considered easier for mounted warriors to drink from, while uguisuhai (literally ‘bush warbler cups’), are designed so that they emit a bird-like sound when drunk from. As an alternative to the tokkuri meanwhile, sake may be decanted from a katakuchi, which is a wide-mouthed vessel with a spout or lip on one side for pouring. A flask, usually ceramic, used to serve warmed sake. Although found in many shapes and sizes, they all have good insulating qualities and a narrow neck. Small ceramic cups for drinking warmed sake, just poured from a tokkuri. They only hold a mouthful or so of liquid, so require frequent refilling. Can be used as a collective term for sake cups, but generally suggests a larger and deeper ceramic vessel than an o-choko, often with a fluted edge. A small cedar wood box, from which sake used to be drunk, but which nowadays often has a small glass of sake placed inside. A ceramic receptacle for pouring sake, which can be used instead of a tokkuri, and which has a wide mouth and a lip or spout at one side. A term literally meaning ‘horseback cup’, given to stemmed ceramic sake cups, which were once thought easier for mounted warriors to hold and drink from.